Spines and blossoms. Beauty juxtaposed against forbidding backgrounds. This is the desert that I love: a combination of ruggedness and vulnerability, like a mythic heroine or an untamed horse. In the springtime, first we see the wildflowers. 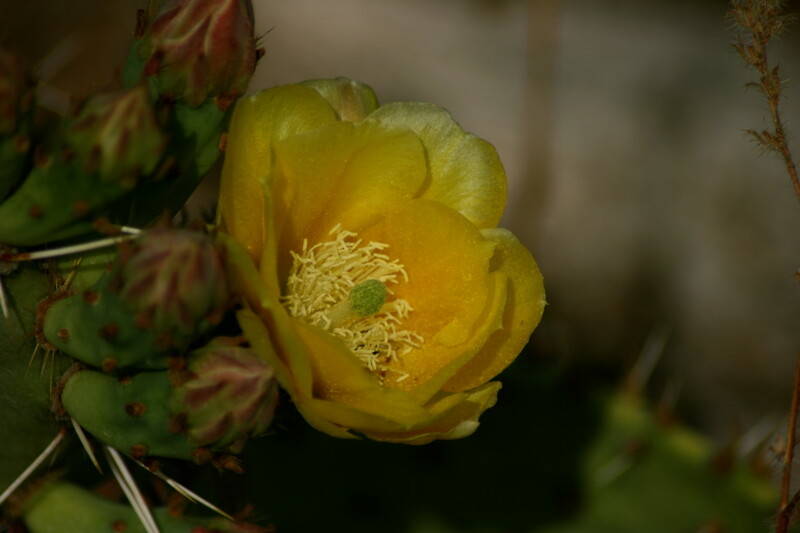 As they fade and the green foliage turns to tan, the cactus blooms burst forth. 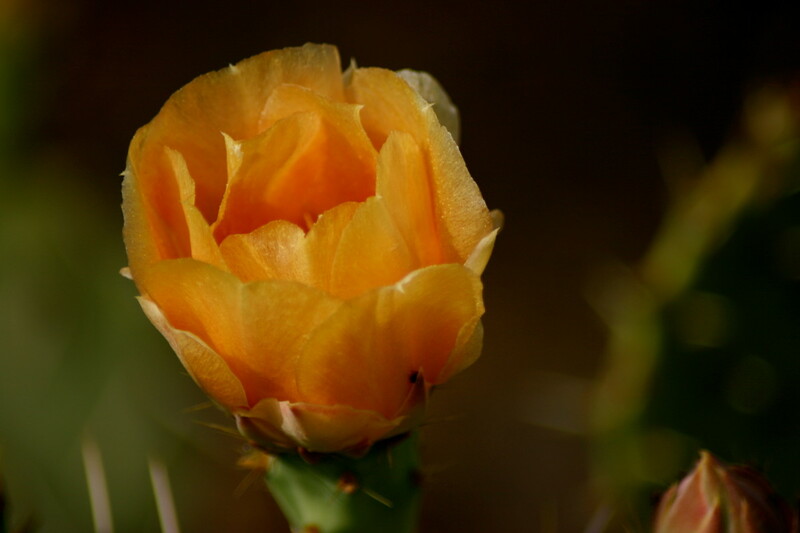 They arrive in layers, like the settlers of this magical place have done; as the prickly pear blooms dull and wither, the saguaro flowers will begin to form. The prickly pear. That simple name belies the amazing diversity of the opuntia plant. 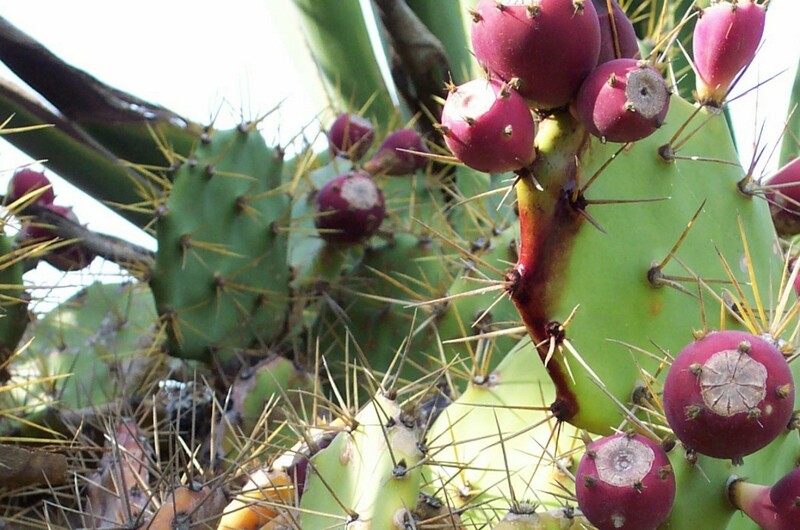 There are purple prickly pear, prickly pear with wonderful pads that can be sauteed and eaten as nopales, prickly pear with beaver-tail shaped pads, prickly pear with lemon-drop clusters of spines. Along with the array of types, each with distinctive features, is an equally impressive selection of blossom types and colors, sometimes two shades on the same plant. Desert dwellers may curse the glochids: those almost-invisible hair-like spines that anyone brushing into a prickly pear can too easily recognize, and with great difficulty eradicate once gotten. 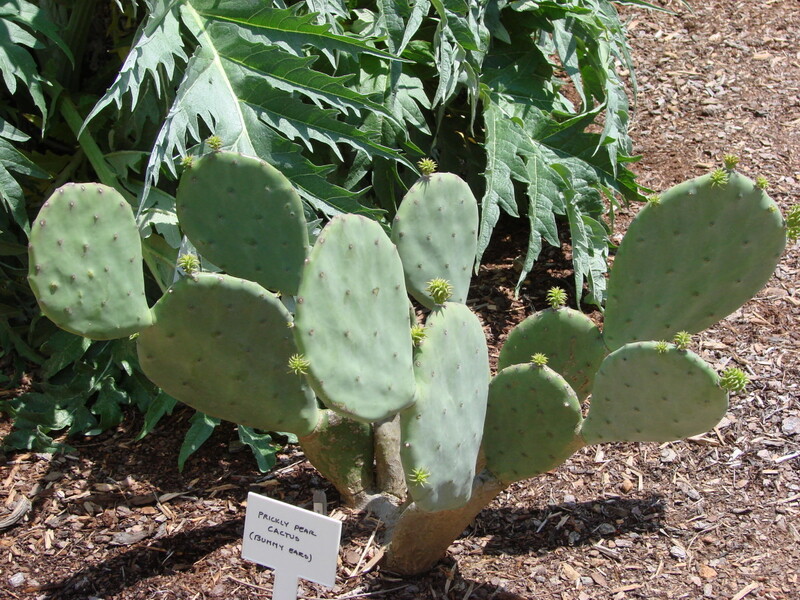 But keep a respectful distance, and the prickly pear is a beautiful cactus. It's useful, too: certainly prickly pear juice (especially when made into prickly pear margaritas) is a true nectar of the desert gods. Suitable for making jellies, said to be a preventive for hangovers, it's a gorgeous magenta color with a remarkable scent. 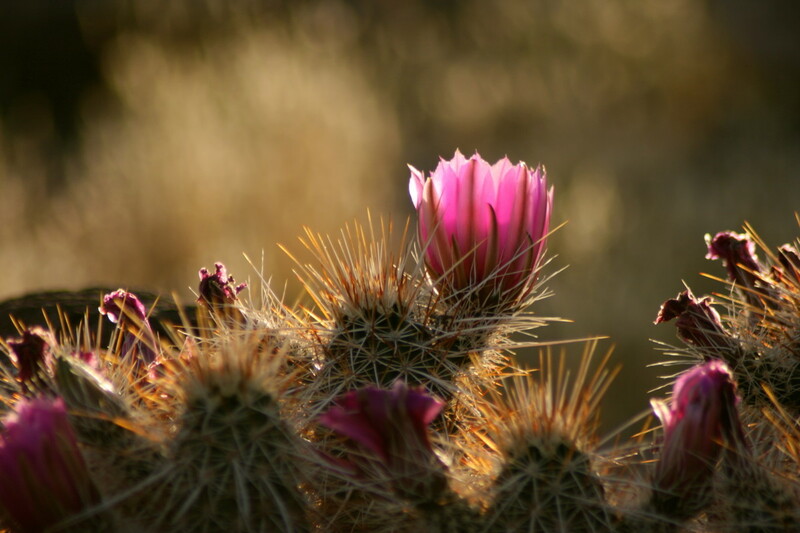 One of the first to bloom in our area, the hedgehog cactus remains one of the loveliest. The fuchsia petals are translucent when the sun's rays stream through at sunset. The spines, though fierce, are attractive in their shape and strength. Aloe vera plants are among the most useful succulents you can grow here. 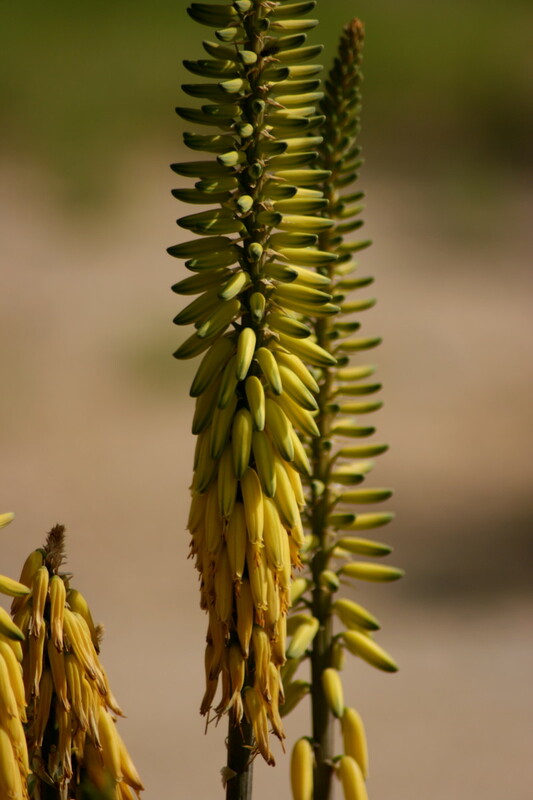 Where commercial antibiotics may prevent infection, they often retard healing; aloe medicinalis, on the other hand, is reliable for speeding healing. 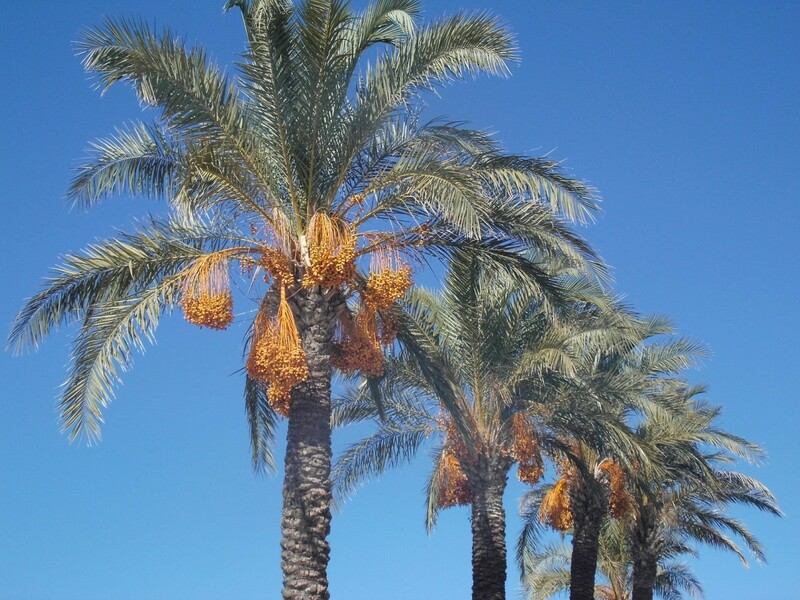 Desert dwellers rely on them for treating the severe sunburn we are prone to if we tarry just a few minutes too long while doing chores, and haven't taken the appropriate precautions (sunscreen or, better yet, long-sleeve shirts). 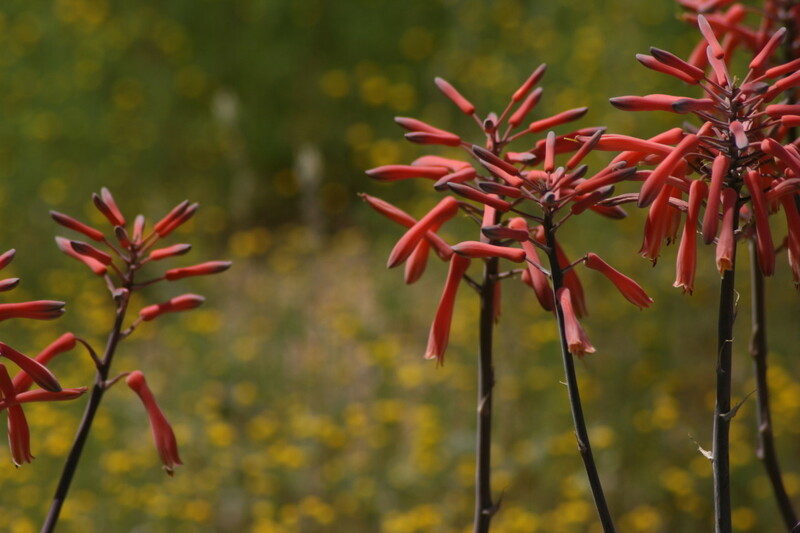 But aloes are not native species in our Arizona desert. They are interlopers, alien, naturalized. I include them here from my own inability to resist sharing their beautiful, practical, striking stalked blooms. Hummingbirds share my fondness for them. We often think only of the infamous "jumping cholla" (lovingly misnamed as the "teddy bear cholla") when we hear the word cholla, but it, too, has an admirable diversity. My favorite, the chain-fruit cholla, grows to tall and imposing plants that look like soldiers in the desert as you approach them. Even my horses grow nervous as they catch first sight of the cholla forest in the distance; I think they see them as bears or humans. Those chain-fruit cholla drop down the most exotic of desert blooms, though, every bit as unique as a tropical protea. Then there are the buckthorn cholla. Not as inclined to go on the attack as the jumping cholla, but every bit as painful when you do brush into them, they boast unbelievably pretty yellow flowers. Take them seriously, though: I've often had the spines slice right through my cowboy boots as I ride too close on narrow trails, embedding themselves at a nasty angle deep into my foot. The interesting and unique ocotillo is not truly a cactus; it's a shrub. It merits mention here for the mere fact that most people, even those who have been raised among them, think otherwise. 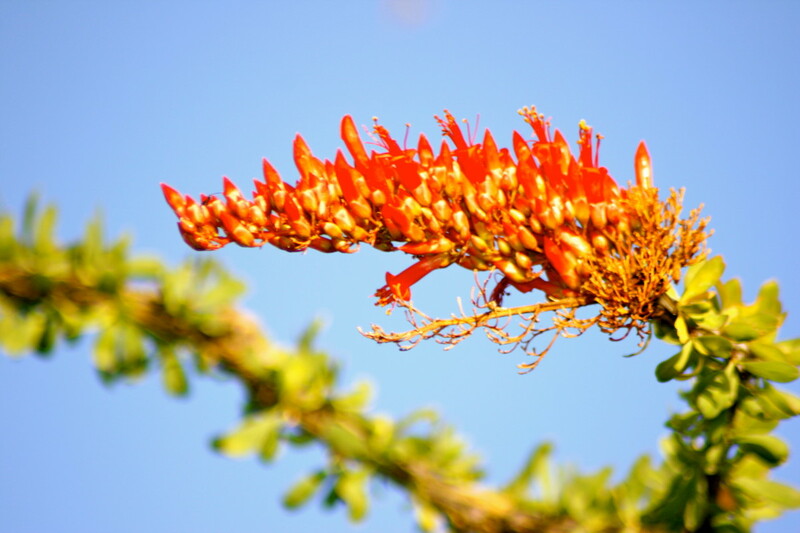 The ocotillo, foquiera splendens, is a quick study when it comes to survival. 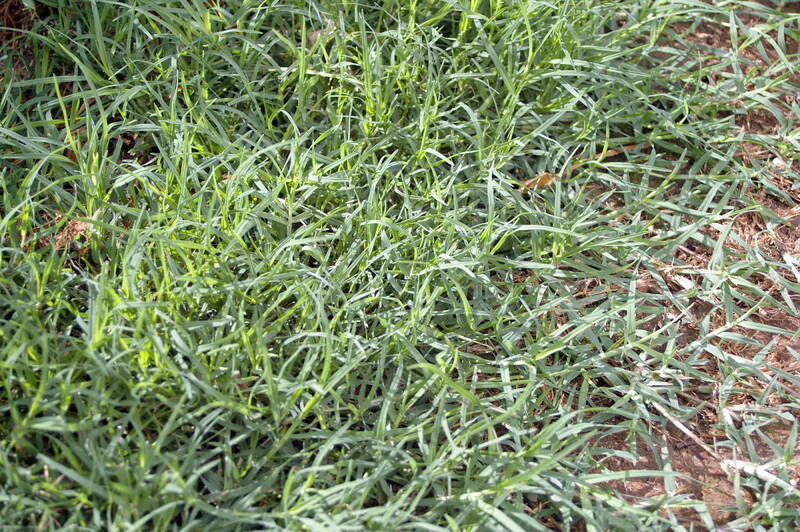 Within hours of the rare desert rain, the usually-bare stems will break out into waxy green tear-drop shaped leaves. In the spring, the blossoms are among the most unusual: sprays of reddish-orange petals with yellow edges, topping the lanky branches. The ocotillo has long been used as a living fence of sorts. 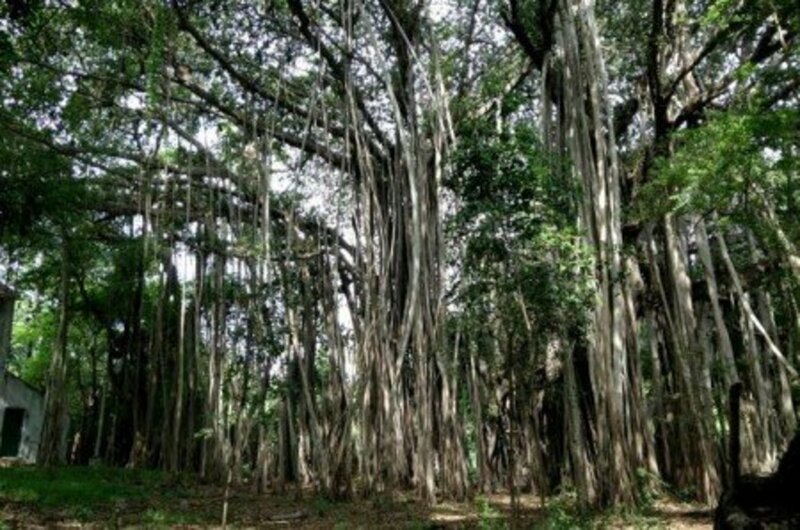 You can chop a branch off and stick it into the ground alongside a chain link or wire-strand fence, and when the rain arrives, the branch bursts open with those leaves. Those lone maverick branches will never again grow into full spreading plants; they'll remain solitary, erect, alongside their fellow transplants, like so many sentries. Because the ocotillo is not a true cactus, they're a bit more user-friendly than their cactus counterparts. Brush into them and you may get scratched; the thorns are sharp and strong. But the spines won't break off in most circumstances, and you'll be glad you tangled with an ocotillo and not an opuntia. 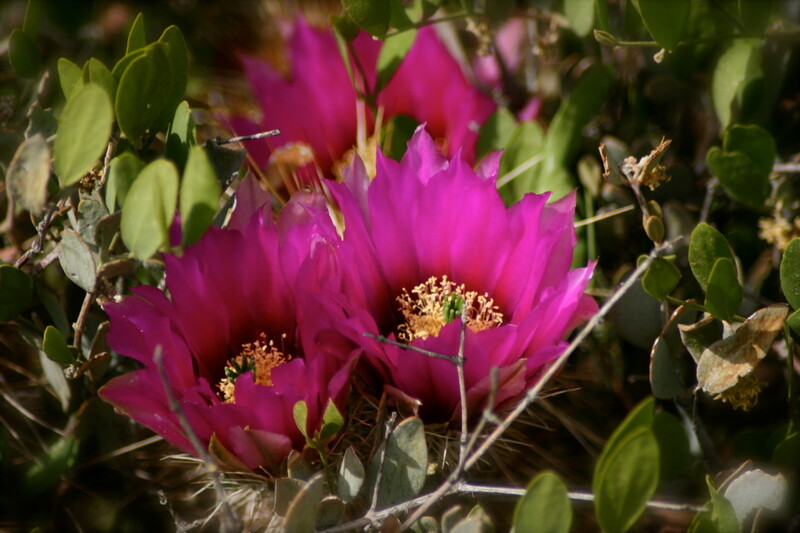 What's Your Preference: Cactus Flowers, or Tamer Fare? Give me a cottage garden, free of spines and hideous biters. It's cactus for me! I like the mix of fierceness and delicacy. It's a flower. I'll take it. Hold the rattlesnakes, though. Flowers? I don't get the whole flower thing anyway. Aren't the Steelers playing? There are more ... so many more. It's early bloom yet, and I haven't been able to awaken some of the heavier sleepers. Soon, though, I'll be prowling again, attentive to the shyer cactus. The photos shared here are my own, taken north of Phoenix in Cave Creek and New River, mostly on my own land. 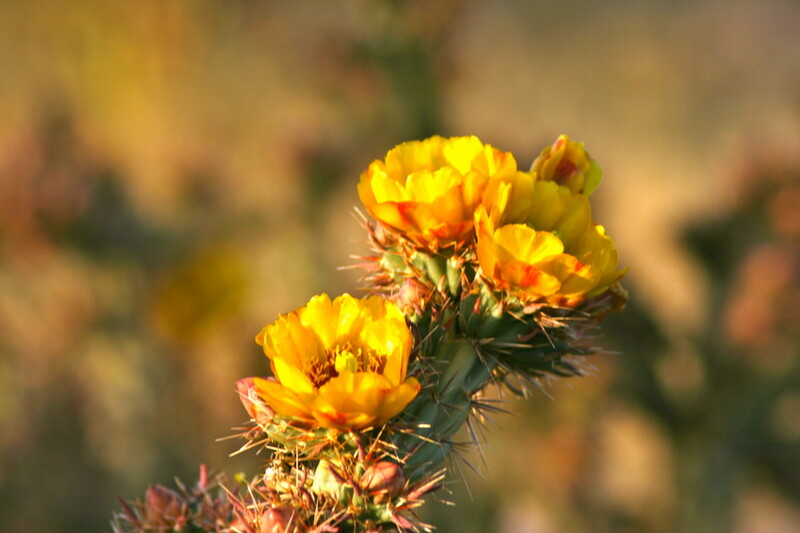 If you visit the Arizona desert during springtime, you can find a rich display at the Desert Botanical Garden -- or take a hike through Spur Cross Preserve. Please, skip the flip-flops and wear sensible shoes. 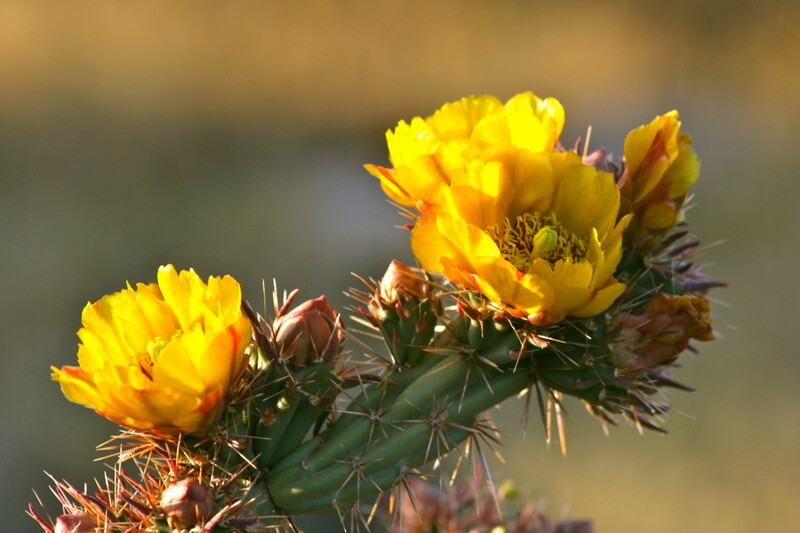 On a wet year, the desert unleashes an abundance of blooms from weeds and wildflowers. 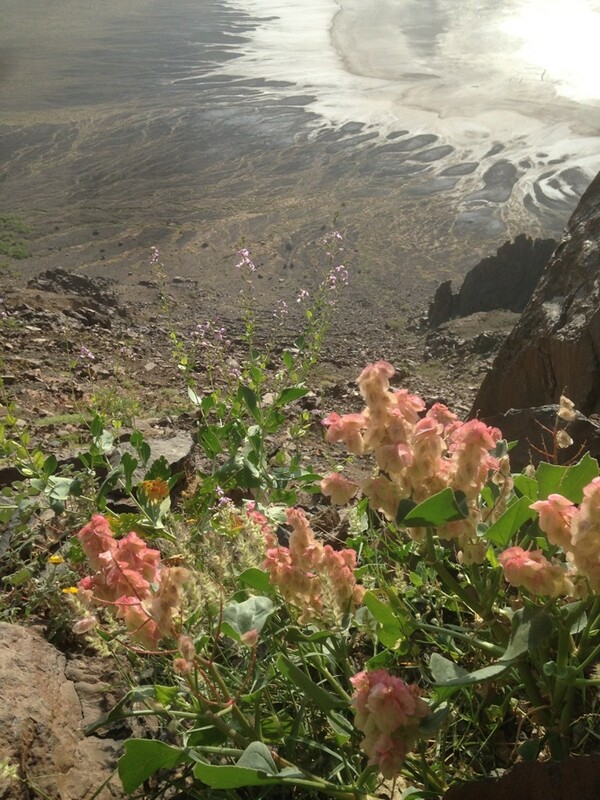 Flowers burst out in a profusion of color that many would never expect from a place misunderstood as barren. Every place has its own texture. The desert's texture is rugged, gritty, oft forbidding, filled with spiny things, sandy soil, and evidence of what has once been -- and has long gone. Keep Company with Cactus Flowers Wherever You Are. All rights reserved. No part of this article may be reproduced, in whole or in part, without the express permission of the author. However, links to this article may be freely shared. Thank you for pinning, sharing, and forwarding links! Thank you so much, Adrienne! I am a big fan of your hubs as well. I bet the cholla you're thinking of is the gorgeous chain fruit cholla. It has the most exotic and almost tropical-looking blooms. They are bubble-gum pink with purple accents and they dangle from where they attach to the cactus itself. They tend to grow quite tall. There is a forest of them north of me and they look like soldiers on the ridge as you approach them; my horses actually get nervous until they see that they aren't predators. They're one of my favorite types of cactus thanks to those stunning flowers. Like the teddy bear cholla, the chain fruit cholla also easily drop their limbs and segments, often from their own weight. Anne Orth Epple compiled an excellent reference book called "Plants of Arizona." My copy is dog-eared from use. If you get an urge to look up some of the interesting indigenous plants here, that's the handiest book to have. Thanks for reading and saying hello! I always love reading your hubs. I am fairly new to Arizona and love to learn more about the local vegetation. I think I have a native cholla in my backyard, only thing is the flowers are not yellow but sort of hot pink, purple like. The fruits look like prickly pears, but not sure if they're edible. Thank you so much for visiting, sharing, pinning and saying very nice things, Au fait! I sincerely appreciate it. I just love sharing glimpses into our unique native plants. I have to get out more -- I had this mental image of cactus being indigenous everywhere in your great state. Even in our upper-altitude forests we have opuntia and yucca showing up sporadically. I love cactus but have only rarely been able to see their beautiful blossoms closeup instead of in a photo. Some people grow cacti in their yards here (TX), but I don't think they're native to this part of the state. I've never seen them blossom here in town. Voting this article up, beautiful, interesting, useful, and awesome, pinned it to my 'Fuschia' board, and sharing with my followers. Thank you so much, Prasetio. 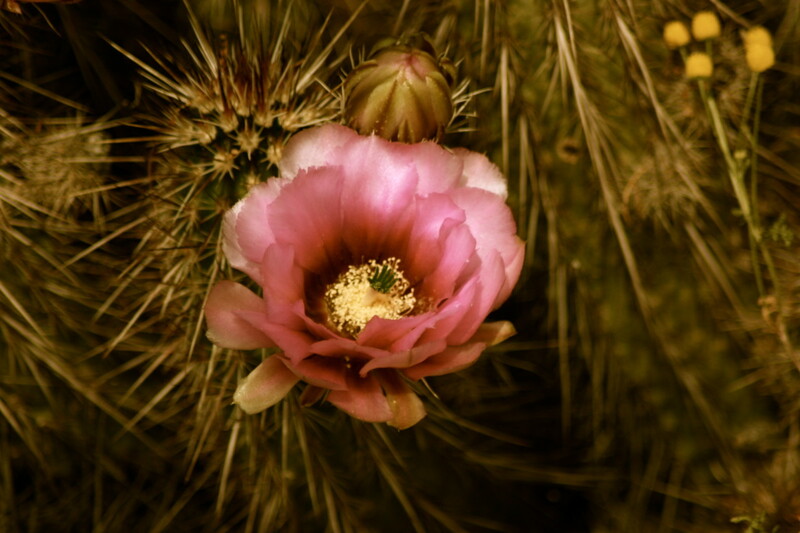 Cactus flowers have a distinctive exotic beauty. I'm glad you enjoyed my photos ... this time of year, I walk around daily with camera in hand! Very informative hub. I love flowers. The photos are strikingly remarkable. Thank you for another wonderful hub. Voted up! Bill, I'm looking forward to your mushroom field guide -- I am mushroom-illiterate, and can't even identify the really cute little mushrooms that have sprouted in my tomato bed. Soon, 100 degree days will be here and they'll be dried mushrooms. I've got to take advantage of our spring weather to get out and enjoy taking photos, because the nine months of summer are right around the corner! Thank you for your visit and comment!